The Chanté Piano Trio, (Maria Parrini, Paul Aguilar, and Stephen Hawkey) all recent graduates of the Fine Arts Center, have been chosen as one of two finalists in WDAV's (89.9 FM from Davidson, North Carolina) inaugural Young Chamber Musicians Competition. Part of the scoring for the competition comes from voting online. Public voting is open through September 1, 2014. To vote for the Chanté Piano Trio please follow this link: http://wdav.org/ycmcvote. The final round performance will be held at Davidson College on September 13. 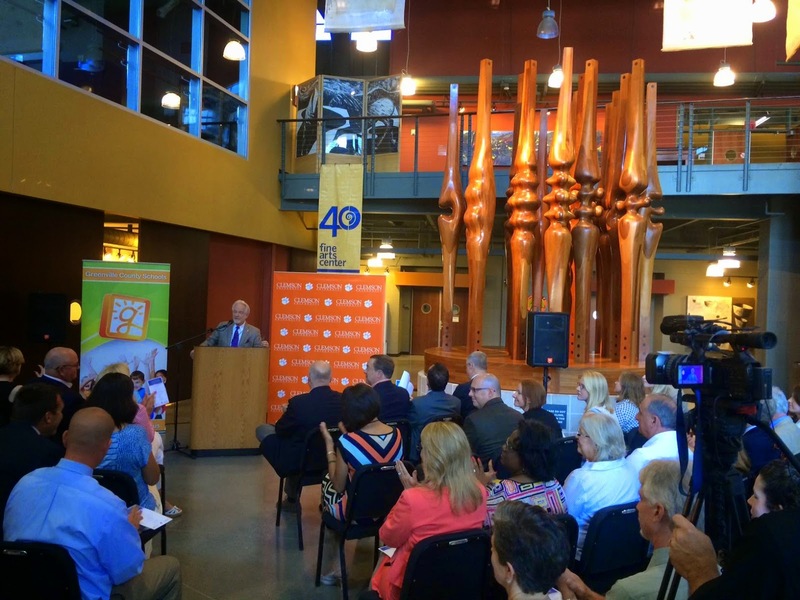 Greenville, S.C. (July 23, 2014) – Greenville County high school students will benefit from the efforts of Clemson University to attract talented student artists. The Fine Arts Center is pleased to announce an educational partnership between its Performing and Visual Arts programs and Clemson University. Beginning in the 2014-15 academic year, students are eligible for up to 9 credit hours for achieving an “A” in Performing and Visual Arts courses at The Fine Arts Center. These credits can be applied to the Clemson University Bachelor of Arts program in Productions Studies, or the Bachelor of Fine Arts in Visual Arts. FAC students continue to achieve at the highest artistic levels, and its recent graduating class of 88 students earned over 10.8 million dollars in scholarship opportunities. Dr. Fluhrer credits Greenville County Schools, Greg Schelnutt, Chair of Clemson University’s Department of Art and David Hartmann, Chair of Clemson University’s Department of Performing Arts for their leadership in reviewing the academic credentials and requirements of integrating the two programs. For more information about this program or to apply, please visit www.fineartscenter.net or contact Gloria Collins at 864-355-2550 x 2553. Established in 1974, the Fine Arts Center (FAC) is South Carolina’s first secondary school for gifted students in the literary, visual and performing arts. As an application based school of 400 students, FAC operates within the Greenville County’s public school system. Students are able to study architecture, creative writing, dance, filmmaking, music, theatre or the visual arts with a faculty of practicing artists. FAC’s 2013-2014 graduating class of 88 students earned over 10.8 million dollars in scholarships and enrolled in over 40 different colleges and universities. The Fine Arts Center's Hattie Odell and Anna Huff work with Greenville artist Zan Wells to protect and restore downtown's great public art. These students received a personal invitation to learn from the artist best known for the Mice on Main sculptures and spent yesterday working with her. Zan is an artist and sculpture who has more than 30 commissioned public works throughout South Carolina. A retrospective of her work is currently being displayed in the Sheffield Wood Gallery on the Fine Arts Center campus.